Weston Hurd partner, John Farnan presented “#MeToo! Coverage for Workplace Claims” at the Akron Bar Association’s Advanced Issues in Insurance Coverage Seminar on January 29. 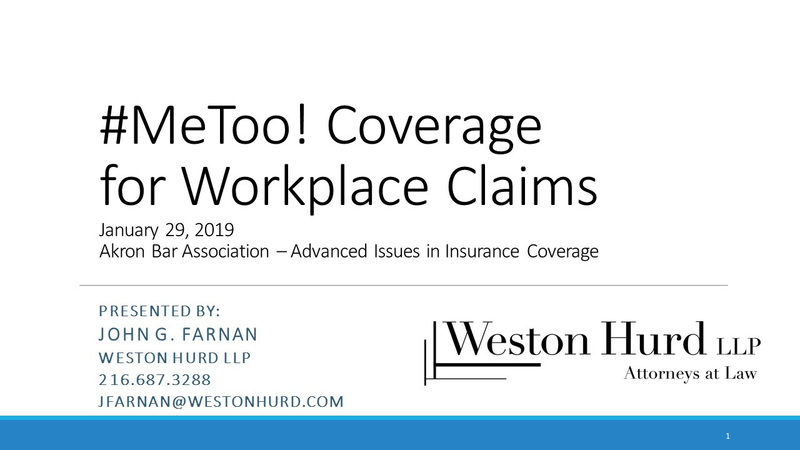 John addressed coverage for workplace harassment, discrimination and other employment related claims under Employment Practices Liability Insurance (EPLI) as well as typical CGL exclusions related to EPLI claims. Relevant Ohio Supreme Court decisions as well as cases outside of Ohio were also part of the presentation.